Today, I thought I'd write about organic gardening methods, particularly my experiences of them as an avid iris grower. When I first took up growing irises in the 1970s, organic gardening was still very much a fringe movement. Storage sheds full of bags of synthetic chemicals intended to address every conceivable gardening problem were the norm. Today, organic gardening has become mainstream. Most modern gardening books emphasize organic practices, and many people are excited about having gardens that resemble nature and use nature's own cycles and processes. This post is not meant to be polemical. Rather, I'm just hoping to provide some starting-off points for people interested in using more organic methods in their own gardens. When I began transitioning to organic gardening methods in the 1990s, I was relatively unconcerned about synthetic fertilizers. A fertilizer is not a poison after all. And what difference does it make if the nitrogen a plant needs comes from a factory or from a compost pile? Nitrogen is nitrogen, after all. But a lot has been learned about the negative effects of synthetic fertilizers in recent decades. The processes used to synthesize nitrogen and phosphorous fertilizers depend on petroleum, and so are not sustainable and contribute to greenhouse gases in the atmosphere. Furthermore, fertilizer runoff has created an enormous problem: eutrophication of our lakes and waterways, causing ecosystem destruction on a huge scale. Granted, home gardeners are not the main culprits in this problem, but why should we be adding to it if we don't need to? Beyond all these considerations, our understanding of soils has progressed tremendously since the mid-20th century. A healthy soil is an ecosystem unto itself, harboring extraordinary numbers of decomposers, from earthworms and beetles down to micro-organisms and fungi. All these creatures process waste matter into nutrients that plants can use, creating a self-renewing reservoir of the ingredients plants need to thrive. A blast of highly soluble nitrogen or phosphorus from synthetic fertilizer can completely disrupt the chemical environment in which the soil organisms live. The instant "boost" the irises get from the synthetic fertilizer comes at the expense of destabilizing the soil ecosystem over the long term. Consider doing nothing. Beginning iris growers are often told something like "fertilize with superphosphate or a low-nitrogen fertilizer such as 5-10-10 before bloom in spring and again in fall." So common is this mantra, that people often do not even step back to consider why fertilizing is necessary at all. There have been flowering plants thriving on the Earth for the last 160 million years or so, and petrochemical-based fertilizers have only been around for about a century. So obviously they are not needed - in the big picture of things, at least. Irises will grow and bloom almost anywhere their water and sunlight needs are met. My advice to beginning growers is to not worry about fertilizers unless your plants appear unhealthy. And then, have a soil test so that you know what exactly is deficient. Then, look for organic methods to supply the deficient nutrients. The virtues of compost. Compost is the single most important thing you can do for your soil. If improves soil texture, helping to capture air and water which plant roots need. And it feeds all the decomposers and other organisms that make for a healthy soil ecosystem. Even better, it does all this almost irrespective of what type of soil you are starting with. Everyone should have a compost pile. But remember its main virtue is as a soil amendment; it must be added in volume to make much of a difference. Composting your kitchen scraps is not going to produce enough compost for a whole garden. You can buy compost from commercial sources. You can also collect leaves and other vegetation waste to compost. Animal manure is also an excellent compost ingredient. There are various other organic products intended to provide specific nutrients, such as cottonseed meal, alfalfa meal, bone meal, blood meal, and so on. These provide organic alternatives to some of the synthetic fertilizers. But as with synthetics, it makes sense to do your homework and learn if the specific deficiencies these products address really apply in your case. A final thought: A boost of synthetic fertilizer can indeed create visible effects quickly. You might get taller stalks and larger flowers, for example. Putting synthetic nitrogen on your lawn can make it look noticeably darker and greener a week later. But these effects do not mean that the synthetic fertilizer is improving the overall health of your irises, or your lawn. Health requires more of a focus on the long term. One well-known herbicide is the focus of controversy everywhere you look these days. I don't intend to engage that particular debate here, as it would quickly take on a life of its own and distract from the bigger picture of organic gardening practices, which is the subject of this post. I find that weed control represents most of the labor involved in my garden. It's a huge task, much more laborious and time-consuming than watering, soil building, grooming, planting, dividing, and all the rest. I think most gardeners' experience is comparable, wherever they live. Consider doing nothing. That sounds ridiculous, but let me explain There's two parts to this suggestion. (1) Consider not using any herbicides at all. 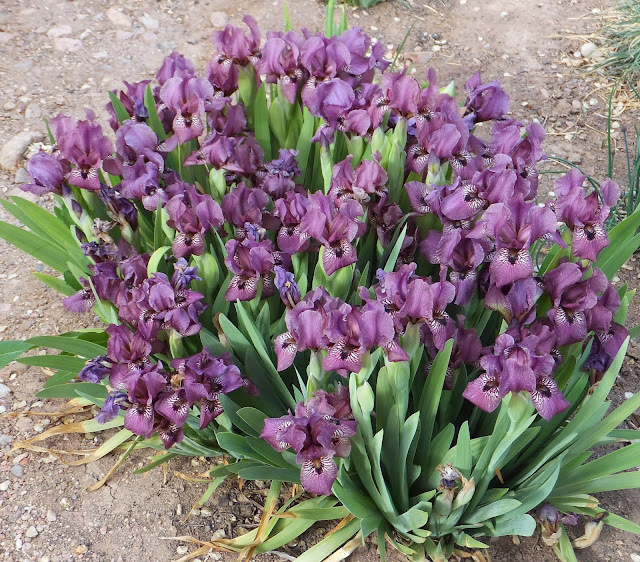 I remove weeds from my iris beds mechanically (pull them out). This is really the only way that is 100% safe for the irises and other desirable plants in the garden. And although it is a lot of work, it does have the bonus of keeping you familiar with how every square inch of your garden is doing. I couldn't do it without my handy padded kneeler, but at present I can more or less manage. Having said that, I do understand that there are many people who would have to give up gardening entirely if hand-weeding were the only option. (2) Consider what needs to be removed, and what doesn't. In recent years, I've become very interested in native plants, and it has changed my philosophy of gardening. Certainly, there are some plants that will absolutely overrun a garden if left unchecked. But there are others that are really only a problem in the eye of the gardener. Originally, I ruthlessly pulled everything I didn't plant. Now, I know all the regular interlopers individually, and I pull things that I specifically know to be problem species. Some other natives (and self-sown garden plants) get to stay if they are in a place where they will not cause serious harm, Native plants in the garden help "tie it in" to the surrounding landscape, and provide benefits for local wildlife. They are also inherently adapted to the environment, reducing water needs and other types of care for the garden as a whole. Understand what you use. If you do decide to go the herbicide route, there are certain questions you need to answer in making your selection. This is just as true for organic or "natural" herbicides as for others. (1) What does it do? Does it just kill top growth, or does it get the roots of perennial weeds? (2) How harmful is it for humans, pets, or wildlife? (3) Does it damage the soil? Some popular "recipes" for making herbicides out of household products circulate on the internet. Just because you can find something in your pantry doesn't mean it's "harmless" in the garden. Do the research. This year, I've been using a commercial product that is a mix of highly concentrated vinegar, orange oil, and molasses. It's very satisfying to use, as it burns off top growth almost instantly. It does have limitations, though: it really needs sunlight to act fully, and it only kills the leaf surface that it actually lands on. This means the to completely kill a plant, you need to apply a lot of it. And of course, it has no effect on roots. I have extremely alkaline soil, so I'm not worried about the effects of the acid - that might be different if I lived where soil was too acid to begin with. It's useful stuff, but not suitable for all jobs. The dangers of chemical insecticides have for decades given great impetus to the organic gardening movement. Things presumed safe by one generation of gardeners are later understood to be dangerous and taken off the market. It's not surprising that some people just want to stay clear of all of them. Today, people are also just more aware of the shortsightedness of introducing poisons into the environment we share with other plants and animals, even if there are no direct consequences for us humans. But most every gardener at some point or other has experienced an insect infestation that has gone completely out of control. Consider doing nothing. It's not necessary to react to every insect sighting or every sign that something has been nibbling on a leaf or two. In most places, in most years, there is an ebb and flow between pests and their predators; nature can be wonderfully self-correcting. Garden planning is an important too, as well. Pests tend to exploit monocultures. The more different kinds of plants you grow, the less likely you garden is to become a beacon to one particular pest species. Some plants actively repel certain pests. Aphids don't like alliums, for example. I have not had the tiniest aphid issue since I studded my garden with clumps of chives. Now this has gone too far! Sometimes, though, doing nothing is not an option. Organic controls fall into two broad groups: predators (ladybugs, for example) or species-specific parasites/diseases. As I write this, I am in the midst of grasshopper infestation of Biblical proportions. All 150 iris seedlings I lined out this spring were killed in a matter of days. A friend recommended Nolo bait, a parasite that eventually spreads through the grasshopper population. It's not instantaneous, but works gradually over months, sometimes requiring further application the second year. local fauna or evil incarnate? A little research on the internet will turn up a range of organic solutions to most gardening problems. One of the things we give up when going organic however, is instant gratification. Organic methods are not about the quick fix, but about putting things in place now that will reduce problems in the future. I know that for some people, the choice to use or not use organic gardening methods has a political dimension. For myself, I am more motivated by a passion for the natural world, the great diversity of life, and a love of growing things. When I use organic methods, I feel like I'm learning how nature works and gardening with nature, participating in the great web of life rather than battling with it. Do you use organic methods in your garden? Yes, my garden is totally organic and a wildlife certified garden. I agree with all your points, Tom! This year I had personal problems that kept me out of the garden and I was pleased how my native plants stepped up anyway. I have a very nicely balanced ecosystem, I think. One year I had so many field mice; the next year the snakes moved in. The big challenge, as you say, is the weeding. I also could not survive without my padded kneeling bench!